A plain rectangular American silver photograph frame, with applied engraved gilt metal seal of the President of the USA; varnished wooden back and strut. 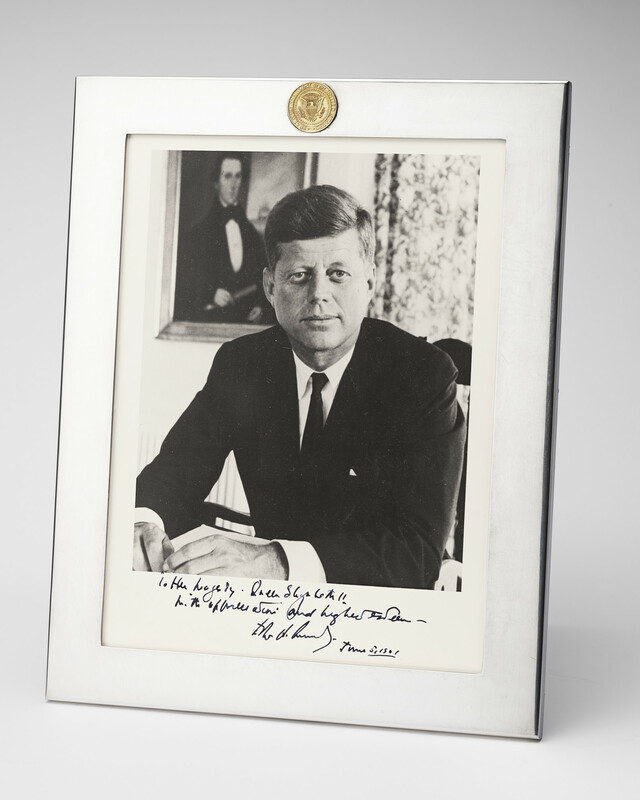 Containing photograph of President John F. Kennedy. The photograph was taken by Alfred Eisenstadt in 1960, probably at the President's home, after he was nominated as the Presidential candidate at the Democratic Convention. The shoot was commissioned by Life magazine, and Eisenstadt later followed the Kennedys on the campaign trail. The handwritten inscription on the photograph reads, 'To Her Majesty Queen Elizabeth II/with appreciation and highest esteem/John F. Kennedy'.